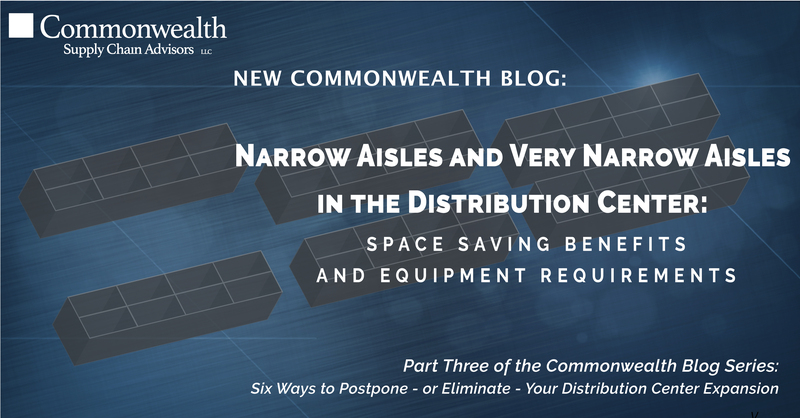 This blog is the third in a series on ways to optimize space in your distribution center to extend its ability to support growth and postpone a capital expansion project. So far, the blogs in this series have covered the concepts of slotting and optimizing storage depths. In this post, we’ll explore aisle widths and the pros and cons associated with the lift trucks that go along with a move to narrow (and narrower) aisles. When expanding the footprint of the warehouse is not an option, companies often employ creative techniques such as using narrower aisles to improve space utilization. 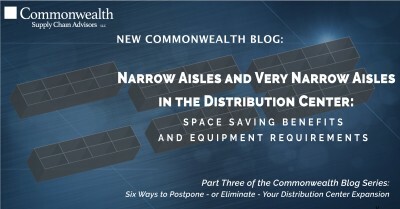 Given the potential for space savings, it can be tempting to redesign a distribution center to utilize this equipment, however, careful thought must go into the design to ensure an effective operation. Often the vehicle requirements are the deciding factor for companies evaluating a footprint that incorporates narrow or very-narrow aisles. Narrow-aisle lift trucks have been in use since the 1950’s, but are still not used in some distribution centers that would benefit from their space-saving features. Conventional sit-down style lift trucks require aisle widths of 11 to 14 feet. Reach-style lift trucks only require 8.5 to 9.5-foot aisle widths and cost only slightly more than sit-down units. However, reach trucks cannot drive in and out of trailers. So, if true dock-to-stock operation is required, then companies should consider a compromise vehicle: the stand-up counterbalanced truck, which requires 10’ aisles. All of these lift truck types cost within approximately 15% of each other. Very-narrow-aisle lift trucks are in a category of their own. These trucks can cost three to four times as much as a conventional lift truck, but they can operate in 5.5’ aisles and offer tremendous space savings. Of the two major categories of very-narrow-aisle trucks, “turret trucks” are generally regarded as the fastest. They can also double as a case picking vehicle for multi-level picking, as the operator rides up with the load. Conversely, swing mast trucks keep the driver on the ground, but are often better suited for maneuvering in tight areas. Since there are only a few inches of clearance between the lift truck and the pallet rack, very-narrow-aisle vehicles usually require rail guidance or wire guidance systems to prevent collisions. The next blog in the series will describe ways you can get creative with unused space above your distribution center dock area to increase capacity. Can’t wait? Read the Whitepaper: Six Ways to Postpone -Or Avoid- DC Expansion or watch the recorded webinar.